Bless you sweet ladies (and gents?) who still visit this little corner of the interwebs. Since I am not quite ready yet to start posting new projects, I thought it might be a good idea go down memory line again. I went back in deep into the archives and dug up an old post that I thought you might enjoy. I loved seeing this one again, as the final product has long since been replaced with new projects. Visiting old projects like this is like visiting old, almost forgotten friends….. I have been working with some twigs again. Leftover from a recent pruning spree. Every neighbor seems to be busy in the garden and they all make so much noise! So I retreated to my peaceful attic and fired up the glue gun. Remember my Twig Wreath? After I had finished that one, I still had a bucket full of cut-ups and branches left. And something inside of me, just couldn’t let me throw them away. Heaven knows why, after all they were just a bunch of small branches and twigs, I have a garden full of them. So in order to control the chaos and not fill my house with the waste I removed from my garden, I decided to make myself come up with a use today – within an hour , or throw them out. And this is what I came up with. Two candle holders. Twig inspired DIY lanterns so to speak. Now if I thought you would need it, I would have gladly made a tutorial but really it is too simple for that. I took and old glass (whiskey style), cut the branches to size and stuck them on with hot glue. For the square box I used an empty Q-tip container. Add some Spring flowers from the garden, and a new vignette is ready for the world. I love how the light of the candle shines between the branches. These little nature inspired, waste recycling, neutral colored lanterns really make my hard sing. So what do you think, was it a good thing I held on to those twigs? Do you love’em or hate’em? I want to hear your opinion here folks! I like them. Anything getting the creative juices flowing is a good thing. Perfection! And I’m so glad to hear from you again! Hi Marianne, cute and I like your idea of setting a time limit. Revisiting our past creations can be a wonderful surprise. Blessings and smiles, Emilou ? Love’em! Glad you’re back. I’ve missed you! This looks pretty cool. I keep seeing these DIYs that are done with twigs on Pinterest and I always want to do something with it. I think I will start soon, at least I am inspired now. LOL. 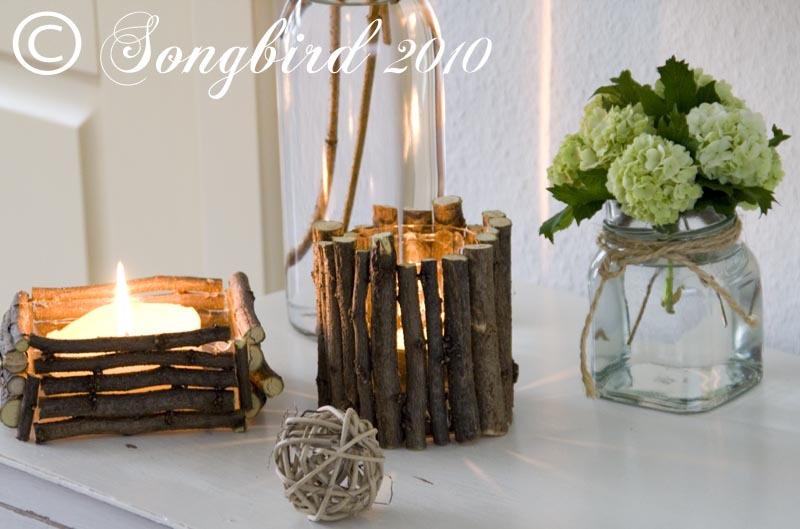 And another DIY that I saw with a similar candle holder look, is where they use cinnamon sticks around the candle. That looked something like this. So beautiful. I love the crispness of the white. I love how the twigs add contrast and another touch of nature to the table.